Explore the Colors of the Rainbow: Rainbow Ice Sculptures for Kids! Spring is an excellent time for chasing rainbows, since the bright sun and brief showers often grace us with one! Children are fascinated by rainbows due to their beautiful variety of colors and magical appearance. 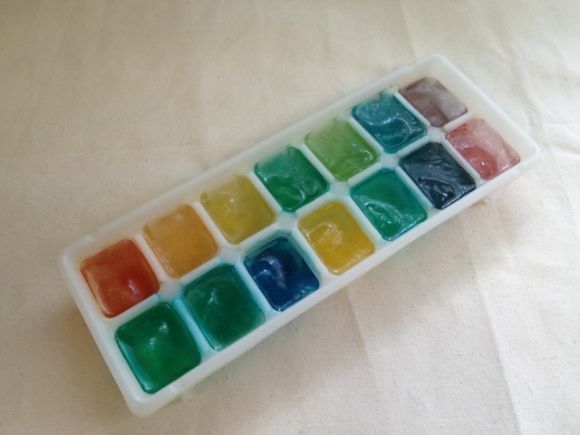 This spring, celebrate the beauty of rainbows by creating your own rainbow ice cube sculptures. These ice sculptures for kids are so easy to make, fun and colorful, and you can make them using just a few items from your pantry. They are excellent for playing with on a warm spring day! 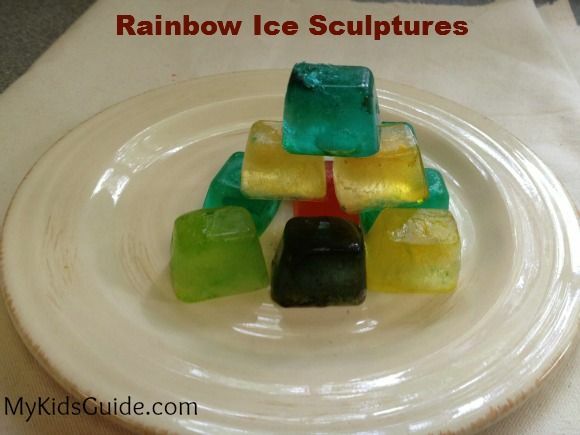 To make your own rainbow ice sculptures for kids, take a look below. You will find that not only are these fun, but they are so frugal as well. In no time, you can have a glistening rainbow sculpture all your own. Here’s how! Supplies for rainbow ice sculptures. Fill each of your glasses with water. Add a drop or two of food coloring to get the color you desire in each cup. This is a great time to talk about the color wheel and which colors mix to make other colors as well. Stir well with your spoon. 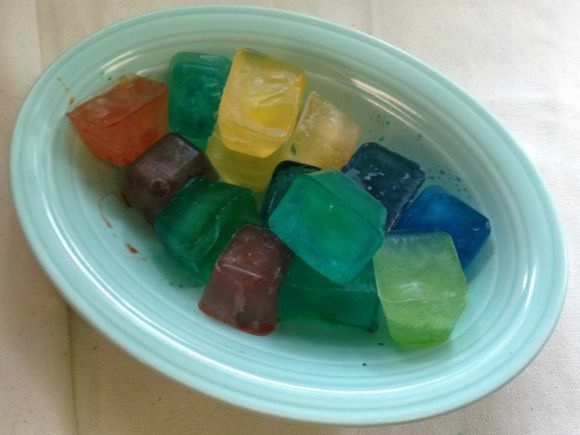 Pour your colored water in your ice cube trays. You will want to make sure you have a variety of colors. Place in the freezer and allow to set for several hours. You can now begin building using your rainbow cubes! Try making towers, buildings, etc. You can build on your cookie sheet if you are indoors or your plastic tablecloth if you are outside! Turn this into a fun science lesson by teaching children the colors of the rainbow, or having a discussion about how rainbows are formed. They will surely be delighted to learn more! You can also add in a math element by measuring your towers, or even the water you are using in this activity. The building and pouring that will take place are also great fine motor skills worth building. As you can see, this rainbow ice sculpture activity is way more than just playing, it is active learning at its best! When you are done, clean up is easy since everything can just be tossed away! Or, you can place back in the trays and save for later. When you’re done playing with your rainbow ice sculptures for kids, there are plenty of texts you can enjoy to enrich this activity! So gather your supplies and get the kids excited to start playing with rainbows! This is a great craft you can enjoy indoors or out, and with very little time or money. So what are you waiting for? Explore the rainbow! What a super fun idea! We are definitely going to have to try that! That is such a fun idea! And i love how simple it is! But I bet the kids have a lot of fun with it! What a cute idea… not only will it help them drink more during the summer it would be great for play time… thank you so much for this idea. Sounds like a great outdoor activity for the summer and a way to cool down! They are very pretty! 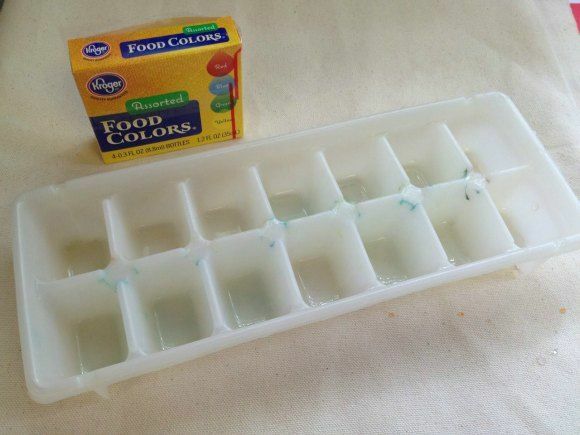 I will have to find some natural food colors and give this a try! Thanks. this sounds like something that is right up my kids ally!! TY for sharing. Sounds like fun! Very clever idea to keep the kids busy. Thanks for sharing.